NetClipboard extends the clipboard to other machines on a network. The app is transparent to the user, no interaction is needed. Data that gets copied to the clipboard on one machine can simply be pasted on any other machine also running NetClipboard. Photos and movies can be sent to iPhones/iPods/iPads and saved in the photo album. NetClipboard is distributed in two versions, Master and Slave. Masters can share data with everyone. Slave versions are free but can share data only with Masters. The Master version is available at the Mac AppStore. On a local area network no configuration is needed. NetClipboard automatically discovers peers connected to the network. Optionally machines running NetClipboard can be given a group number. Only machines on the same group can exchange clipboard data. 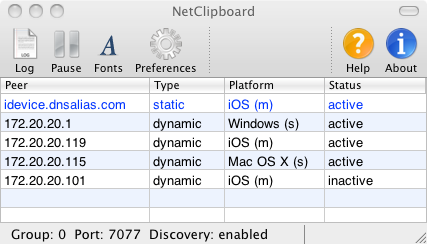 NetClipboard supports multiple platforms. It is currently available on Microsoft Windows, Mac OS X and iOS (iPhone/iPad/iPod). Using NetClipboard is straightforward, just copy something to the clipboard on machine A and paste on machine B.